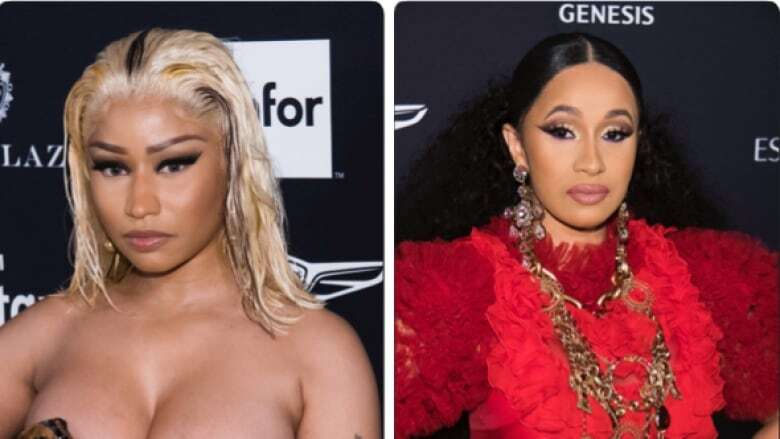 The ongoing feud between rappers Cardi B and Nicki Minaj escalated Friday, turning physical at a New York Fashion Week party. The ongoing feud between rappers Cardi B and Nicki Minaj escalated Friday — and became physical — at a New York Fashion Week party. According to social media video as well as multiple media reports, Cardi B was seen lunging at Minaj during the annual Harper's Bazaar Icons soiré​e. In one video, Cardi B, wearing a red gown, is seen moving toward the Anaconda singer as several onlookers fumble with their phones. In another, Cardi B is shown being held back. Cardi B was then captured leaving the party, with what appeared to be a bump on her forehead and wearing no shoes. The two successful rap artists, who both grew up in New York, once appeared to be friendly and even shut down rumours of a rift. Minaj publicly congratulated Cardi B in 2017 when the breakthrough hit Bodak Yellow earned Cardi her first No.1 spot on the Billboard Top 100 chart. They also collaborated for the first time on the 2017 track Motorsport. But a rivalry seems to have escalated since. In a profanity-laced Instagram message posted late Friday night, Cardi B, who recently had a baby girl with rapper Offset, referred to the fight but did not mention Minaj by name. She blamed criticism of her mothering skills as the reason for her anger. "When you chose to mention my child, you choose to like comments about me as a mother, make comments about my abilities to take care of my daughter is when all bets are [expletive] off," she wrote. Minaj has not commented about the incident. Cardi B, 25, and Minaj, 35, have both acknowledged in media interviews and on social media their influence as role models for young girls around the world. In a video post last year, Cardi B said: "I really need to be a better example." The video has since disappeared from her account.